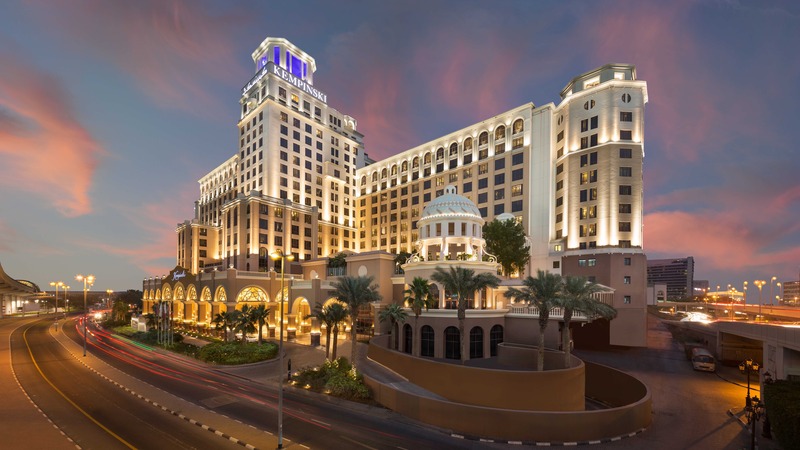 Kempinski Mall of the Emirates earlier this month unveiled its extensive $100m refurbishment which started back in 2012 and we took to the hotel itself to see what had been done to make this already fabulous hotel even more fabulous. Included in the refurbishment was the overhaul of all 373 guest rooms and suites including the re-design of the luxury Aspen Chalets that overlook Ski Dubai, although these are currently in the last phase of completion, expecting to be ready to welcome guests early 2016. In addition, the hotel boasts a new conference facility, three new dining outlets and a whole new look to the hotel lobby; quite the makeover for Kempinski. Connected to Mall of the Emirates, the second largest and easily the most luxurious mall in Dubai, the Kempinski hotel here is the most successful hotel for Majid Al Futtaim properties and it’s easy to see why. It’s location is unrivaled for those looking for a centrally located luxury hotel with access to the wealth of amenities and services that a Dubai shopping mall provides. A short drive away from Dubai Marina, Palm Jumeirah and Downtown Dubai, this hotel is at the very heart of this bustling metropolis, great for both business and leisure travelers. This 48,000 square metre property has been a beaming iconic along the Dubai skyline since 2006, the first of the Kempinski properties to open up in the city. Having stayed at many Kempinski properties worldwide I was intrigued to see whether such a lofty cash injection would allow this hotel to remain true to the understated luxury of the Kempinski brand, the oldest luxury hotel collection in the world, coupled with the exceptional service that guests have come to know and trust. Walking into the hotel lobby, at first glance I couldn’t see much difference from last time I was there but upon closer inspection subtle yet remarkable changes had been made. Everything appeared just that bit brighter, bit shinier and bit larger than before. I was pleased to notice that walking into the lobby of this hotel felt as if I was still walking into a Kempinski property, with contrasting light and dark wood and marble so shiny you can see your reflection. High ceilings and lots of glass and chrome reflect make this striking hotel entrance not only inviting but flooded with light. Perhaps everyone’s favourite talking point about this hotel lobby leading into the lobby lounge, Aspen is the crystal windows that separate this hotel and the mall itself, glistening against the light like the tiny snowflakes residing next door at Ski Dubai,adding to the overall sense of luxury. This is not your standard hotel. Check-in is a smooth process and the central elevators whisk you up to your residing floor. Floor 8, where our Grand Deluxe Room was situated. With views out towards the Burj Al Arab and the sea beyond this is a great choice of room for visitors to the region. The room itself shows just where the refurbishment money was spent. A spacious welcoming space with a separate living and bedroom area, decorated in rich, plush furnishings with more than an element of bling. A sanctuary of dark wood, gold and polished glass this room is the epitome of luxury living. The large floor to ceiling mirror behinds the door adds to the feeling of spaciousness and the two large 46 inch TVs adorning the wall of the living area and the bedroom have clearly been part of the ‘no-expense-spared’ vision when this hotel was redesigned. The furniture is polished glass and spirals up to the focal centerpiece of the crystal chandelier light that hangs proudly over the impossibly high over-sized bed. In fact the bed, is the very best thing about this room; you need to climb up onto it and then immerse yourself in the softness of the duvet, a welcome respite from a hard days shopping let us tell you. The beautiful, large bathroom adjoins the bedrooms by sliding dark wood doors and comes equipped with motion sensor under lights that aid in getting around the room come nightfall. The bathroom is large enough for two people to share without overcrowding and a deep bath is tucked away under a wall of a mirrors opposite a large walk-in power shower. There’s even an iPad so that you can browse the in-room dining menu at your leisure in the most technologically advanced way possible. Everything about this room, and indeed hotel, screams luxury, perhaps representative of its mostly Arabic clientele’s expectations. For even more luxury upgrade to one of the suites, with panoramic views over Dubai’s glittering skyline and if staying in the Presidential Suite you are even treated to your own private terrace. With elegant dining rooms in all suites, space is the ultimate luxury here. Guests staying in one of these lavish suites also have access to the Executive Lounge on the 11th floor. There’s nothing more special than a stay in one of our suites. With panoramic views over Dubai’s glittering skyline, guests can marvel at the city or invite friends over for a get-together on the Presidential Suite’s private terrace. With luxurious freestanding bathtubs and elegant personal dining salons in all suites, there is space for everyone to relax in luxury. Guests staying in one of these lavish suites can also enjoy access to the Executive Lounge located on the 11th floor. Of course, one of the unique aspects of Kempinski Mall of the Emirates are the Ski Chalets, which as mentioned are due to be completed early next year. A sneak preview showed that you can still take in the powdery piste of neighboring Ski Dubai whilst relaxing in a cosy interior with a log fire you really are transported to the mountains of Switzerland behind your closed doors. With private butler services and personalized check-in, these chalets really are a completely different take on luxury Dubai hotel accommodation. In keeping up with Dubai’s ever-changing dining scene, Kempinski Mall of the Emirates has introduced brand new dining concepts to its portfolio. Levantine is the signature restaurant where not only breakfast but dinner is also served. Breakfast is standard buffet style with a strong focus on catering towards Arabic guests and dinner comes in the form of an a la carte menu serving up outstanding Levant cuisine. Try traditional hot and cold mezzes and savor dishes such as Kebdet Dajaj (chicken liver with pomegranate to you and i) and Lebanese Fatoush (vegetables marinated with sumac) before you devour main dishes such as the excellent mixed grill or the oriental-spiced spit-roasted lamb as you dine al fresco on the terrace or in the pleasant surroundings of the inside restaurant. The night doesn’t have to stop there however for this hotel houses one of Dubai’s newest and most sought after hotspots; Noir. This cocktail lounge boasts a seductive jet black interior that leads out onto a fire-pit lit terrace where you can take advantage of the unrivalled cocktail menu under the glow of the moonlight. Other notable parts of this hotel include the Softouch Spa complete with state-of-the-art fitness center, tennis court and two swimming pools. This is a hotel that deceives from the outside, boasting more facilities than your average beachfront property. Treat yourself to a host of Softouch treatments from massages to facials as you make the most of all that it has to offer. This hotel, regardless of the vast amount of money that has been spent on transforming its interior, is a game changer for Kempinski, easily one of, if not the flagship Kempinski property worldwide for its impeccable attention to detail, unrivaled service and the fact that it offers so much that so many other hotels in the region and beyond, simply cannot. Is this a family hotel? Not really. Is this a property for business travelers? Potentially. Is this a property for travelers to the region (or indeed residents themselves) looking for a unique luxury property that takes the stress away from shopping by being right next door? Absolutely.